Maximize your revenue with display advertising, connect Platform with your Adserver and implement Dynamic Ad Insertion. Share content easily and quickly to your target audience. With Platform you can increase your audience simply. Mediastream OVP offers personalized and excellent support to each of its clients at any time. You can have a historical record of the content captured from your signal, generate relevant video fragments, upload it to the cloud in real time and share it on your social networks or your website. Everything without having to go through external platforms. 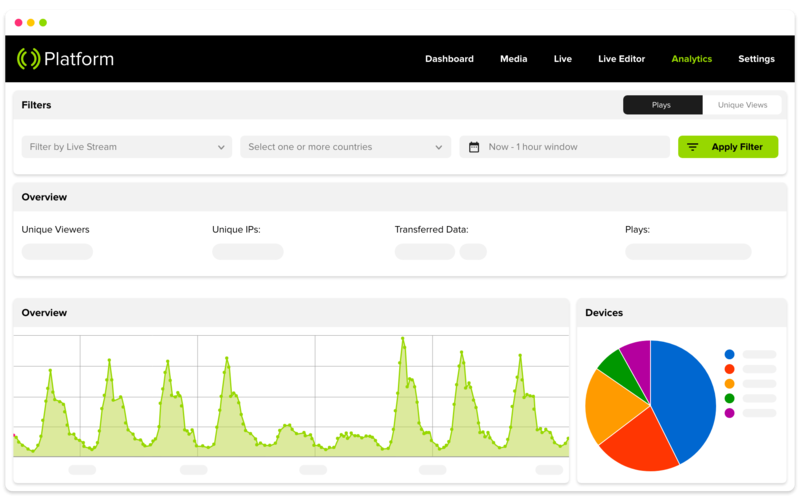 Receive analysis of audience behavior and know the consumption of content in real time. All the tools you need to make decisions and optimize your digital video strategy. Load your content once and automatically generate encoding from 144p to 1080p and capture of thumbnails. Our own HTML5 responsive player compatible with multiple devices, streaming responsive playback and integration with social networks. Protection of your content through access token, DRM, geofencing, network restrictions, by devices or by referrer. You can record your live broadcasts in the cloud and make them available automatically on demand. Ad Server Integration - VAST / VPAID. Add more revenue, in any currency, with the integration of the most important payment platforms of the world. Platform has a complete API for all the integrations that you and your developers may require. Mega wanted to centralize and manage their videos. 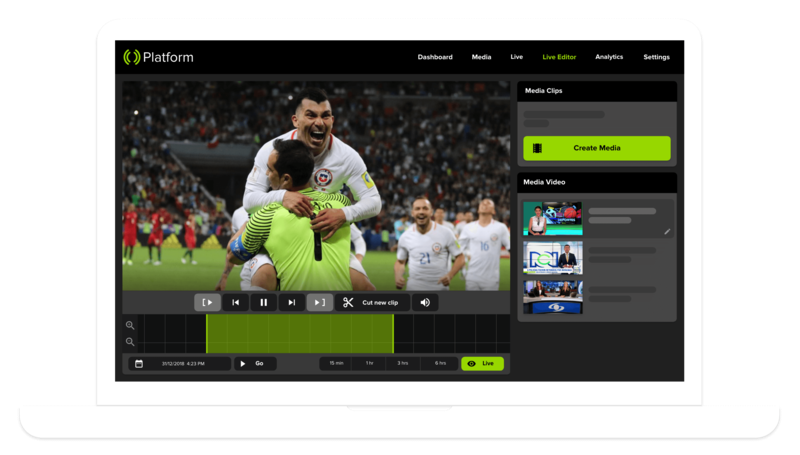 This chilean TV channel was looking for a provider with a very stable platform to support high audience volumes and at the same time deliver statistics to the final public. Less time needed to upload content. Transmission of events to more than 200 thousand users at the same time. 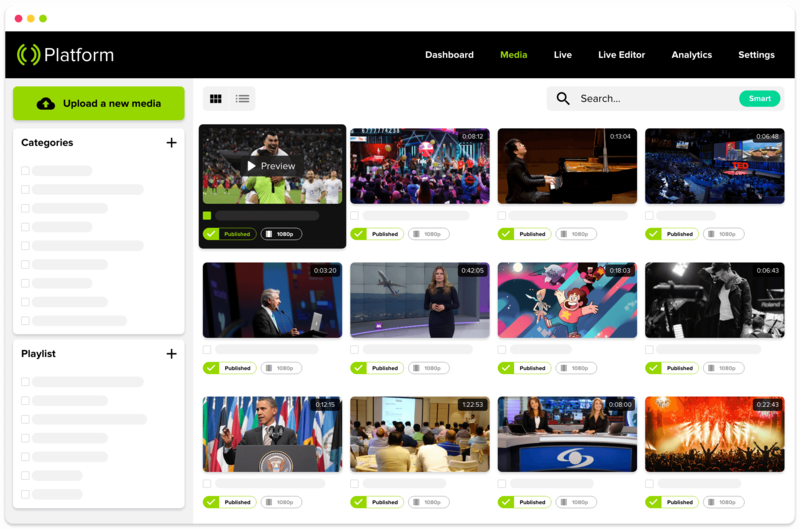 Caracol required a platform to fulfill all the needs of its digital video strategy: To be able to support high concurrences, CDN with presence in Colombia and first level support in Spanish. More than 100.000 simultaneous live users. More than 150.000 assets published. Integration with current CMS, encoder upgrade and video publication.